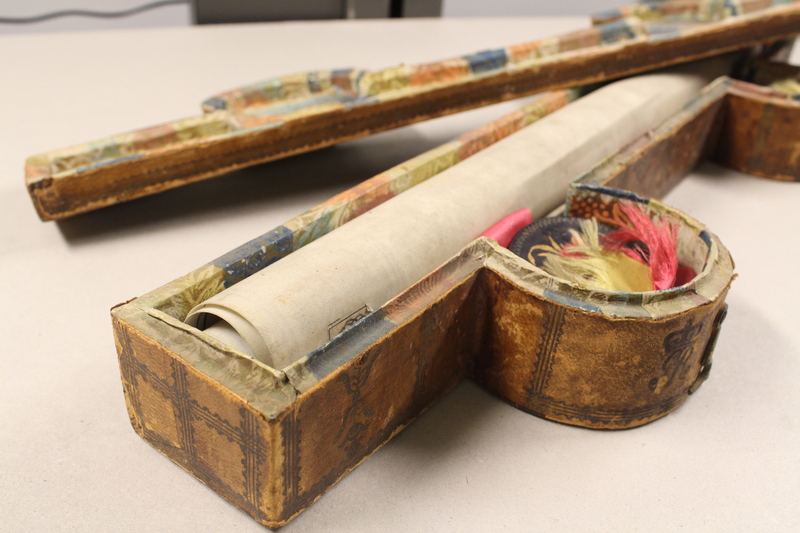 As well as asking our users about their favourite documents from our collections, we have also been asking ourselves. 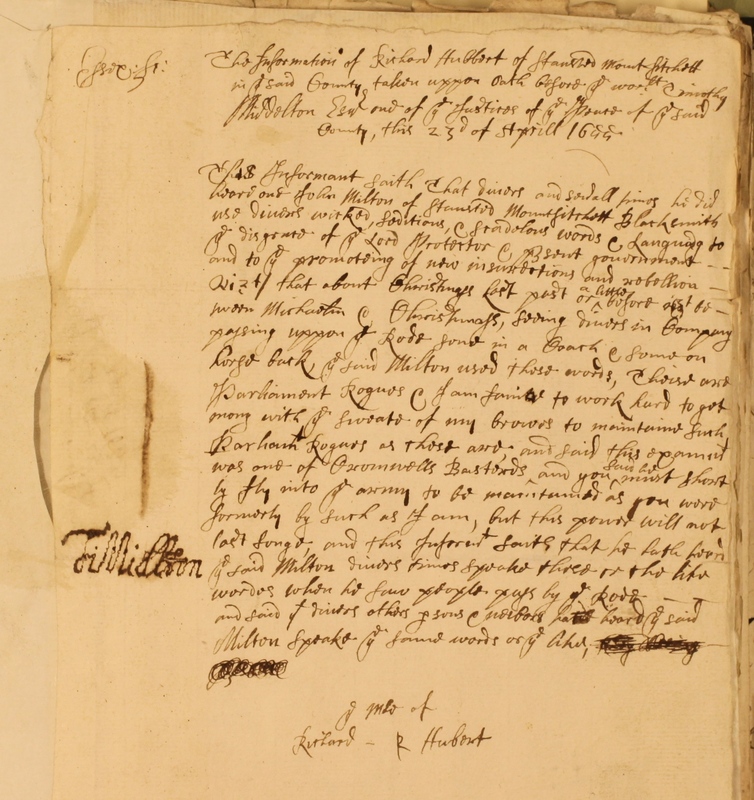 Here, Archive Assistant Edward Harris tells us about one of his favourite documents, the Grant of Arms to Thomas Barrett Leonard 1st Baronet (D/DL/F170). 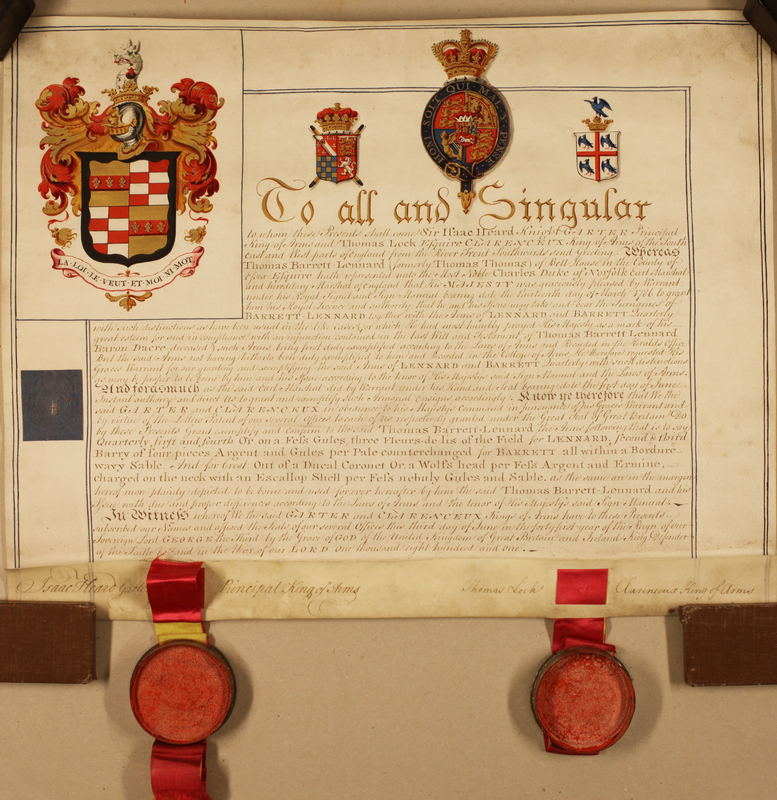 This document recites a royal warrant of 13 March 1786 which directs the Garter and Clarenceux, kings of arms, to grant to Thomas Thomas the right to adopt his father’s surname, title and arms as per his father’s will. Thomas Thomas was an illegitimate son of Thomas Barrett-Leonard, 17th Baron Dacre, and Elizabeth FitzThomas. He went on to be MP for Essex South and a Deputy Lieutenant of Essex. 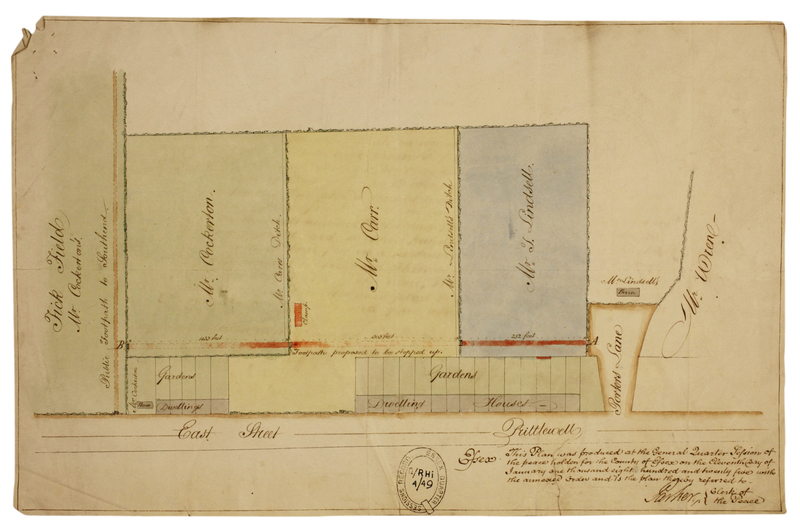 He was created 1st Baronet of Belhus in 1801. His eldest son Thomas became an MP for Maldon, but predeceased Thomas Sr who died aged 95 as the most senior member of the baronetage in 1857. He was succeeded in his baronetcy by his grandson Thomas (why give up on a good name?). This document has always stood out for me as it was one of the first documents I noticed on when I began working at the Record Office, as its distinctively shaped box caught my eye. I am sorry to say that it was only recently that I actually unrolled it and discovered the wonderful illumination inside. The purpose-made box for D/DL/F170 , with special containers for the two pendant seals. For me it was always the meaning behind it that appealed to me. This is a document which was the making of this one man. It transformed him from a relatively wealthy gentleman into one of the foremost members of the nobility in Essex, an opportunity that he clearly didn’t squander. Without this document his life would have been somewhat different. The esteem in which he held it is obvious. The box is carefully made and decorated and the document itself is pristine to the point of looking almost brand new. We have a portrait of Thomas’s painted by John Opie, and it now hangs on one of the walls in the Searchroom, next to a portrait of his first wife. 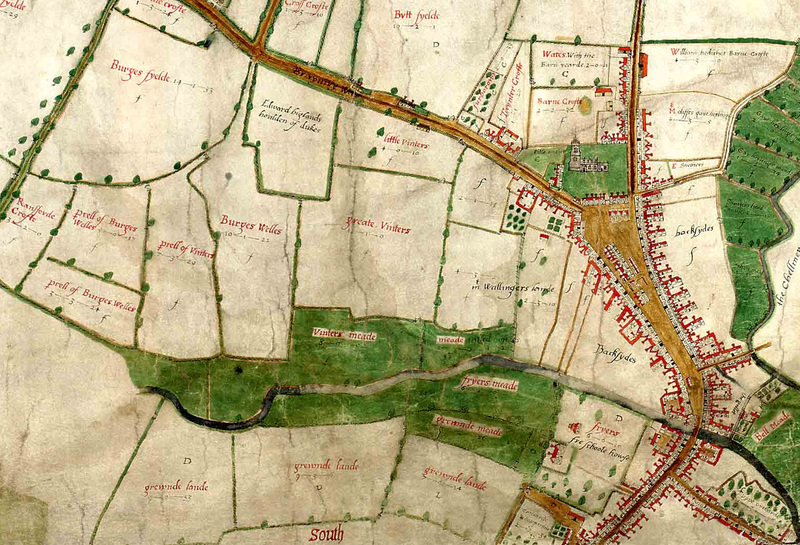 I very much recommend having a look at it on your next visit – he looks every bit like a man who had to prove himself, and this document certainly helped. 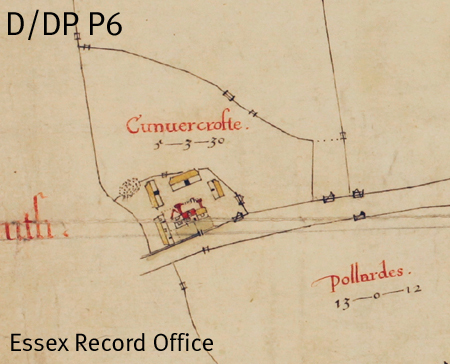 As well as asking our users about their favourite documents from our collections, we have also been asking ourselves. 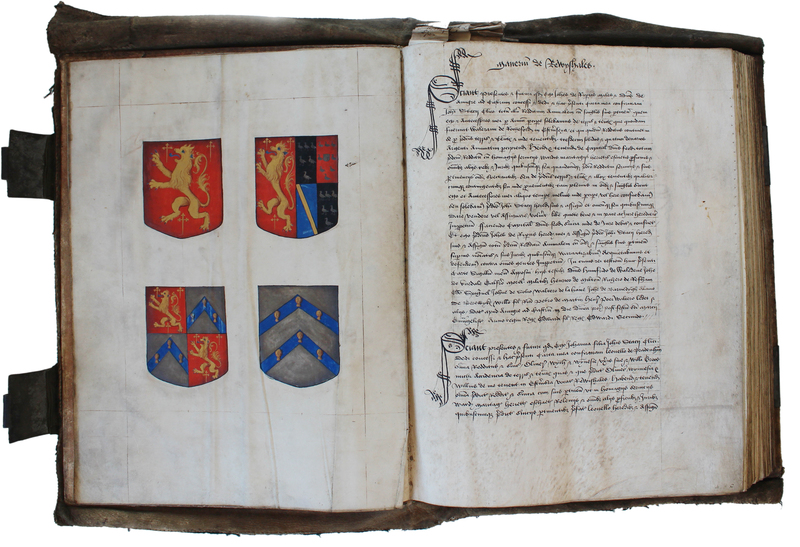 Here, Senior Conservator Tony King shares his perspective on one of his favourite documents, a cartulary of the estates of Sir William Capel, 1294-1511 (A8173). Some of the nominated documents will feature in a display at our open day on Saturday 14th September. 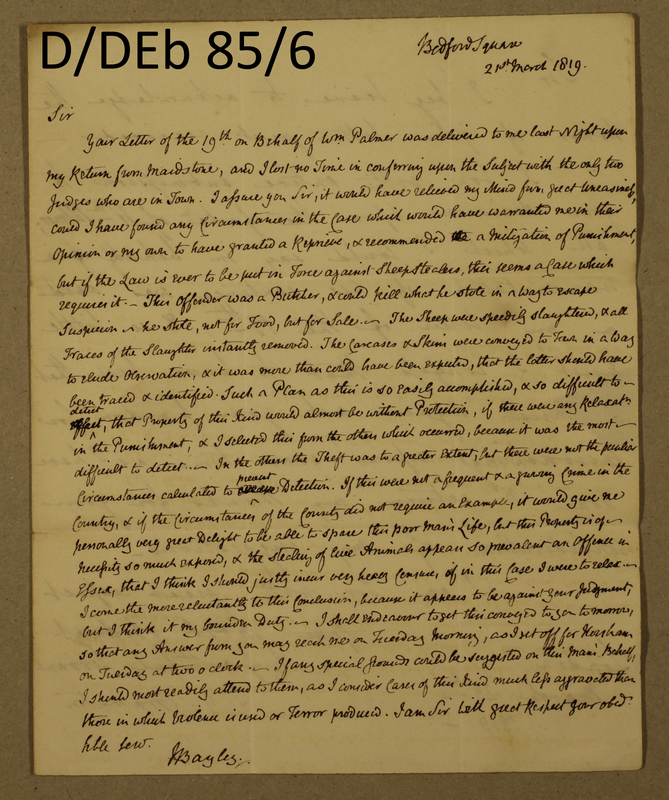 As a Conservator at Essex Record Office I am lucky to have contact with some remarkable documents from the collection so it is difficult to pick a favourite but Acc. A8173, a cartulary of estates of Sir William Capel, c.1511 encapsulates many of my favourite aspects of interpreting our collection. Documents can reveal so much, not just from their written content but also as a physical object; the craftsmen who made the parchment, the scribe who filled the pages and the binder who bound them together have all left their mark on this volume. 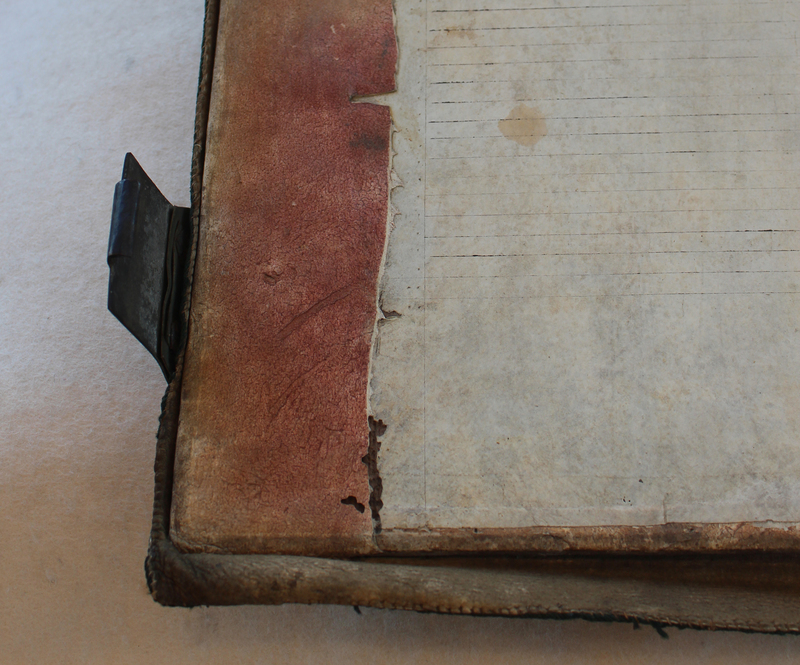 The parchment pages of the volume show numerous small repairs carried out through the ages. 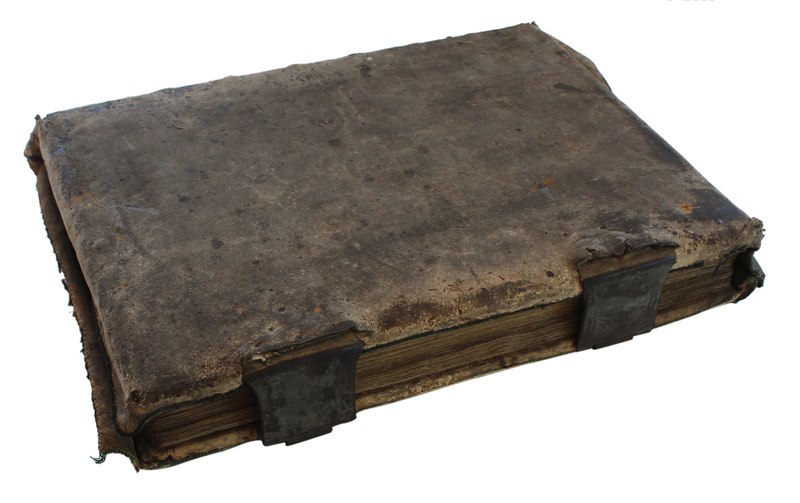 Some are healed scars sustained while the animal was still alive, other small patches were applied by the parchment maker while the processed skin dried and other tears happened hundreds of years later and have been patched by subsequent users of the book. The binding is a rare surviving example of a chemise binding where a soft allum tawed leather cover is stitched together and the bound book slipped into it, very much like a dust jacket on a modern hardback book. The edges of the chemise cover overhang the top and bottom edges of the book to form protective flaps over the edge of the pages. Although the chemise now appears grey, areas that have been turned onto the inside of the boards and have been protected are red in colour indicating that the whole cover may have been dyed red originally. This book seems to have had a long working life and shows signs of regular use. The metal clasps which keep the boards securely closed, maintaining pressure on the parchment pages to keep them flat, are later additions as shown by evidence of earlier fittings on the back board which would have held straps to do the same job. This indicates that the book was still relevant many years after its binding and was maintained as a working resource. Not only is the volume a rare example of this style of bookbinding, it also bears the physical evidence which points towards hundreds of years of use. Further examination of the binding structure and condition would yield more information about the techniques and decisions made whilst making it and hint at how it was used and regarded in the past. Scientific techniques such as DNA analysis could tell us the species and breed of the animals used for the parchment shedding light on the medieval parchment trade. This cartulary demonstrates how as well as holding a wealth of information in the text, a document can also provide a window on the past by looking closely at it as an object. As part of our 75th anniversary celebrations this year, we want to hear from you. 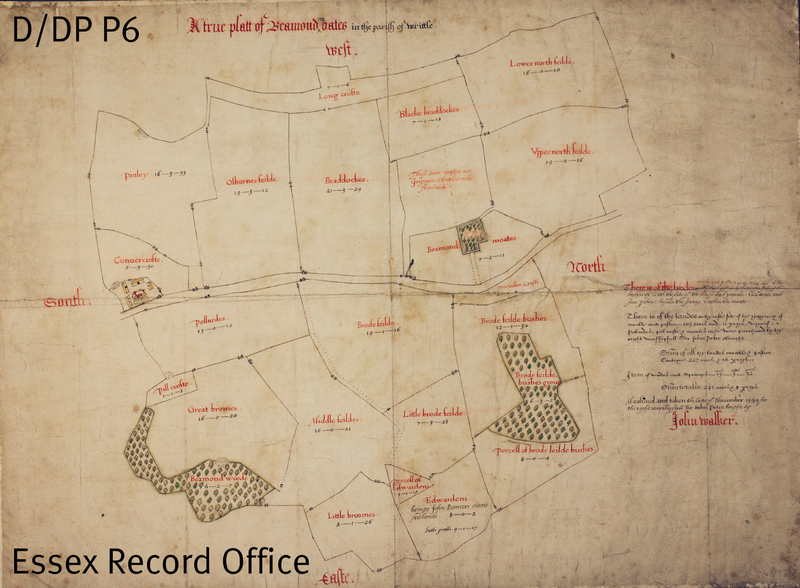 We always like to hear how searchers are using our collections, whether it’s in the Searchroom or online through Seax and Essex Ancestors, so we’ve decided to ask searchers to nominate their favourite record, and to tell us what it is about it that appeals to you. 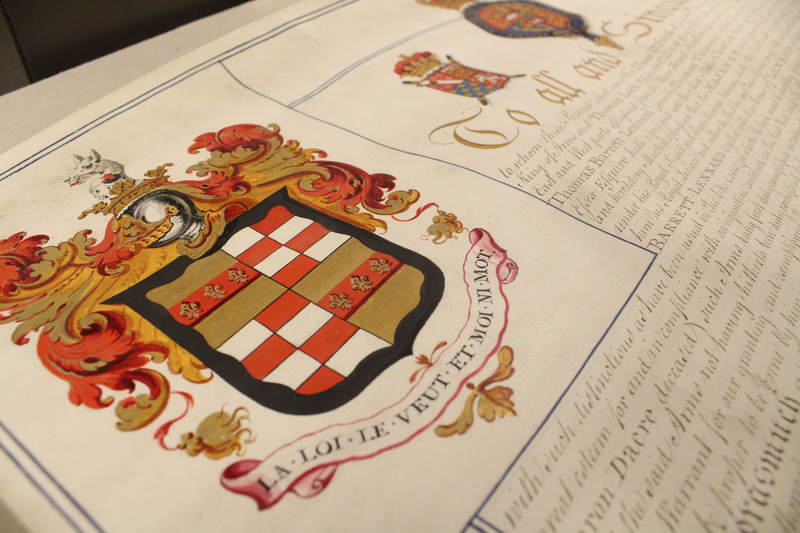 Nominated documents may be featured on our blog or in displays at our open day on Saturday 14 September. Bastardy Bonds were used to protect parish ratepayers from ending up paying to support unmarried mothers and their children if the mother was unable to support herself. 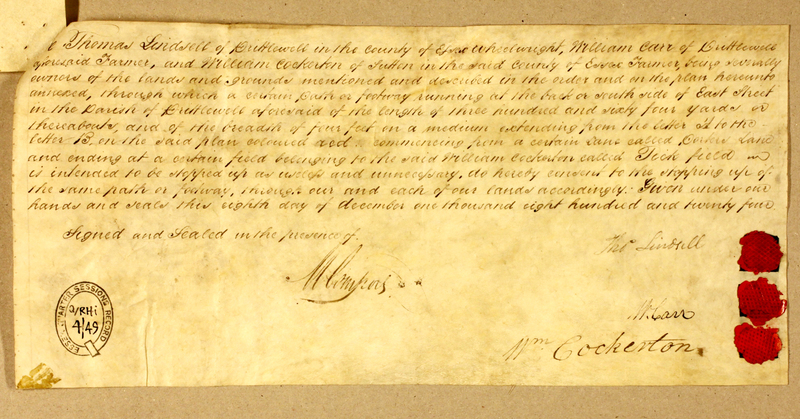 There are hundreds of such bonds in our collection, mostly dating to the eighteenth century, but this one particularly stands out for me because of the story it tells. Dated 24 April 1773, the bond tells us that Ann White, a servant at Audley End near Saffron Walden, had given birth to a male child, the son of Biagio Rebecca, an Italian painter employed at the house by its owner, Sir John Griffin Griffin. Rebecca had acknowledged that the child was his, but clearly had no intention of marrying the hapless Ann. 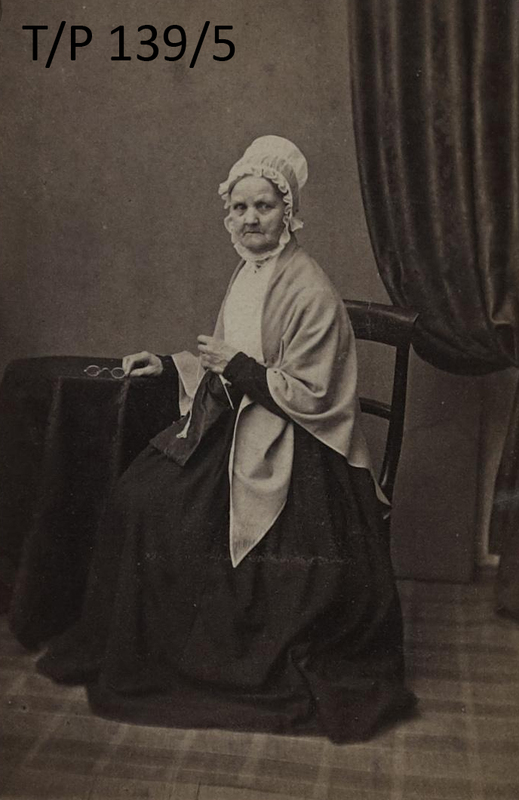 To indemnify the parish from ever having to support her and their child, Rebecca had agreed to deposit £100 with Sir John Griffin Griffin, to whom Ann would have to apply when in need of funds to support herself and the child. In paying this lump sum, Rebecca absolved himself of all responsibility to Ann and their child. You can view the document in full on Seax here. You can still see Biagio Rebecca’s paintings at Audley End, and read his entry in the Oxford Dictionary of National Biography (Essex Library card holders can access the ODNB for free with their library card number).